When you enter the paleo community, or really just the clean eating community, you begin to think more and more about your daily life and what is involved in it. Not only do you think about the food that you put into your body, but you begin to become aware of other things that are part of your daily life. Like lotions you’re using on your skin or makeup you’re putting on your face. And you also become aware of some of the chemicals you’re using at home daily to clean your kitchen, bath and everywhere in between. But knowing what ingredients are harmful and which ones are not can be a bit challenging. There is so much information out there that it’s hard to wade through. Well today I’m here with a solution – Thrive Market! I’ve talked about Thrive Market many many times in the past because it’s one of my favorite ways to grocery shop, but Thrive Market has way more to offer than just food. They have vitamins and supplements, beauty products, bath & body products, pet supplies, and they also have cleaning products for your home. But instead of having to look up all the harmful ingredients online, write them all down, them skim through all the products at the grocery store; you can simply click on the Home tab on Thrive Market, search Cleaning Supplies, and find non-toxic products in seconds! It’s that easy! You can shop cleaning products by different categories including: Non-Toxic, Dye & Color Additive Free, Fragrance Free, Hypoallergenic, Essential Oils, Paraben Free, Phthalate Free, and SLS Free. This is exactly how I’ve started to stock my cleaning supply cabinet at home. It’s easy, it’s simple and I know I can trust the products that are being delivered to my house! And guess what? All the products are below MSRP! Before I share my favorite non-toxic cleaning supplies, I think it’s important that you know that the Environmental Working Group reports that indoor pollution is a health hazard, and cleaning products can be a major contributor. It’s so easy to understand how terrible smoking nicotine is and even how secondhand smoke can be just as bad. But we often forget about the products we are spraying in our home and therefore inhaling ourselves. Or the products we are washing our dishes with then eating off of. I personally think it can feel a little overwhelming at times so I often just push the thought aside. But with Thrive Market, I don’t even have to think or worry! Thrive Market only carries brands that are non-toxic, clear of any harsh chemicals, and most are scented by plant-based essential oils! Thrive Market Citrus Dishwasher Packs – These dishwasher packs use only plant and mineral based ingredients! And they are 27% off MSRP, only costing $7.99 for 45 loads! 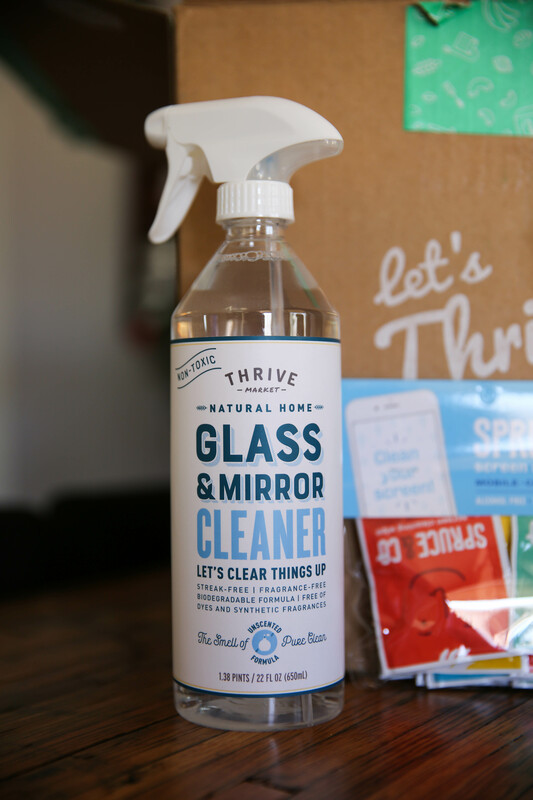 Thrive Market Glass & Mirror Cleaner – This glass cleaner is made without harsh chemicals, dyes, or fragrances so you can breathe easy every time you use it. Plus it’s only $3.29 which is 45% off MSRP. 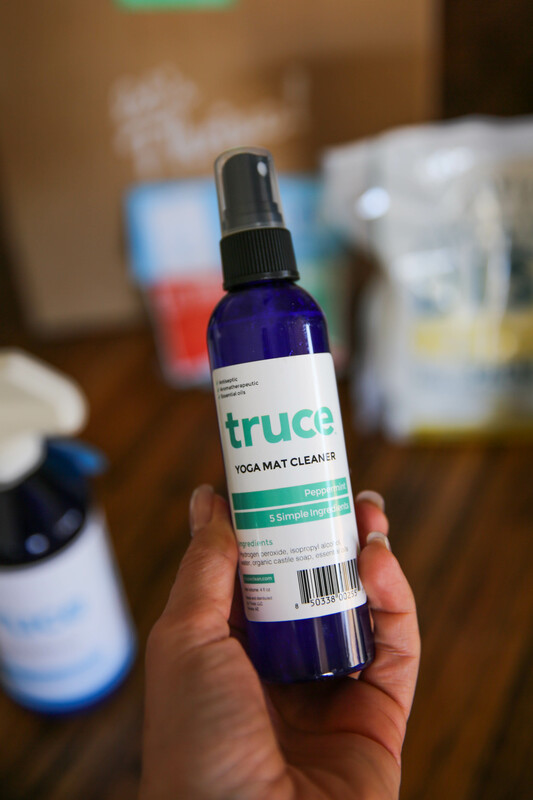 Truce Yoga Mat Cleaner – Since I just started yoga back up, I need to keep up with keeping it clean and fresh. And this yoga mat cleaner comes in peppermint fragrance and only has five simple ingredients – rubbing alcohol, water, pure soap flakes, hydrogen peroxide, and aromatherapeutic essential oils. Plus it’s 33% off MSRP! 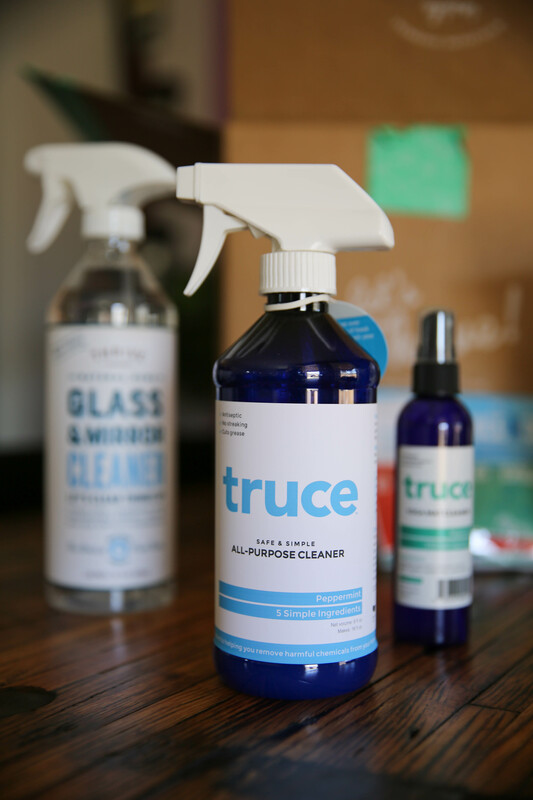 Truce All-Purpose Cleaner – If you want your house to smell amazingly fresh, get this clean! It uses peppermint and rosemary essential oils to refresh while it safely shines and cleans everything from mirrors and glass to granite, stainless steel, tile, linoleum, slate, natural stone, and even concrete surfaces. The bottle comes with the concentrate so you just have to add your own water. And it’s only made with five ingredients – Water, Rubbing Alcohol, Hydrogen Peroxide, Organic Castile Soap, Essential Oils. Oh yeah, as for savings – it’s 37% off MSRP! Seventh Generation Disinfectant Wipes – This is my least favorite product of all that I’m listing today just because I’m not a huge fan of the smell. BUT I’m happy to have disinfecting wipes on hand for quick clean up, especially since these ones are non-toxic and get rid of 99.99 percent of germs and bacteria. You’ll see these in the grocery store almost everywhere but only on Thrive Market can you get them 13% off MSRP! Spruce & Co Screen Cleaning Wipes – How often do you clean your phone and/or computer. If you’re like me, close to NEVER. So gross. Our phones are computer hold so many germs and bacteria, but thanks to these individually-wrapped screen cleaning wipes, you can remove all the smudges and sketchy things that cover your screens. And they are 25% off MSRP! What we put in our bodies is so important and I think I’ve pressed that subject quite enough over the 8 years I’ve had this blog. But I think it’s time we all start to take a deeper look at what is in our cleaning supply drawer and if we are comfortable with the ingredients that we are spraying in the air. It may feel a little overwhelming at first, but if you have Thrive Market, there is really no need to stress. I’ve even created my own PaleOMG Spring Cleaning Kit on Thrive Market so you don’t have to write all these items down. All you have to do is click here to enter your email and it will take you straight to my non-toxic cleaning products page! 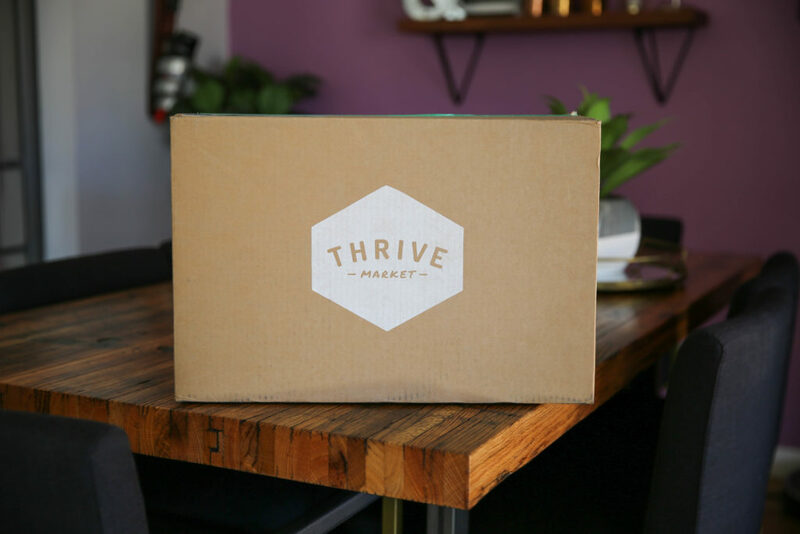 And if you are new Thrive Market, not only will you get up to 30% off your Thrive Market’s prices, but today you can get an EXTRA 25% off your first order + free 30 day trial! All you have to do is click here and it will add the discount to your first order! Something that I absolutely LOVE Thrive Market is that every time you shop, you get a breakdown of how much you saved just because you shopped with Thrive Market. Then at the end of the year, you’ll get an email letting you know how much you saved that year with all your purchases! My membership just renewed last week and I got an email that I saved $691 last year by shopping through Thrive Market. $691!! Think about how much you could do with an extra $691 in your pocket! So cool. 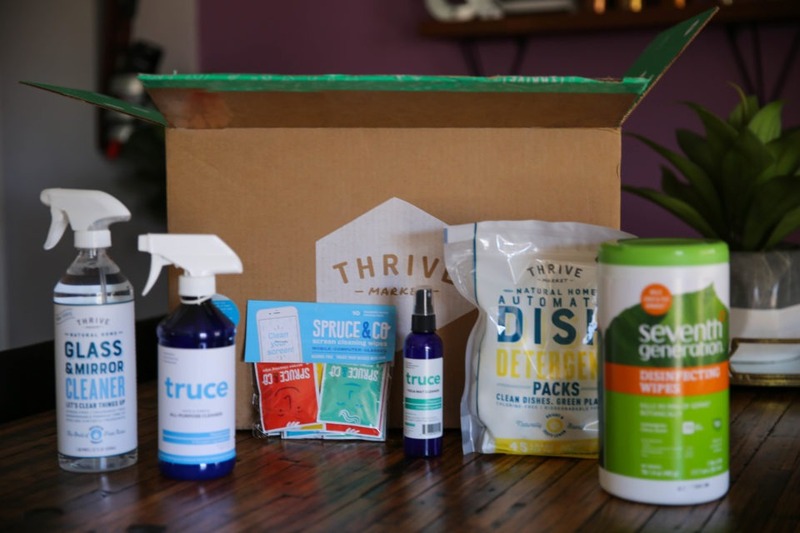 I hope you love Thrive Market as much as I do and this post gave you a help in the cleaning supplies world. I know I was totally lost before I started shopping through Thrive Market. This post is brought to you by Thrive Market. It contains some affiliate links and I may be compensated for this post, but all opinions are my own. This compensation helps with expenses to keep this blog up and running! Thank you for all your support! Thanks for this posting Juli! I am a member of Thrive Market and order many food products from them, but never realized they had these non-toxic cleaning supplies. I will be sure to check them out and thanks for your recommendations! yay!! glad i could introduce you to some new products!! This is music to my ears! I’m definitely ordering all of these, especially the yoga mat cleaner – I’m not the best at making DIY concoctions, so this is SOO in my ballpark. Have you tried Mrs. Meyer’s cleaning supplies? i have!! love that brand too! !